There are about three hundred museums in Moscow, each of them regularly updates its exposition and excursion plans. But for many, it goes unnoticed. To improve the situation, the Moscow Department of Culture decided to create routes of exciting museum trips for the whole family and thus to awaken children and parents’ interest in the museum exhibition spaces. We were to give this idea the bright and most contemporary realization. Thus we created a lively and playful logo, picked up large fonts, reminiscent of fairy tales, and chose eye-catching colors. It was done to give museum announcements the richness of culture and facts, emotions and fun. To begin with, because of the international significance of the National Committee activities, we offered the client to update its identity. Thus a symbol of five different seamlessly intertwined ribbons appeared. The logo symbolizes similar ideals of five independent but friendly and cooperative countries. The same five colors laid the basis for the site design. Jury experts do not just visit museums during the program, but also evaluate the routes and guides, keep diaries, express their opinions and offer their innovations. 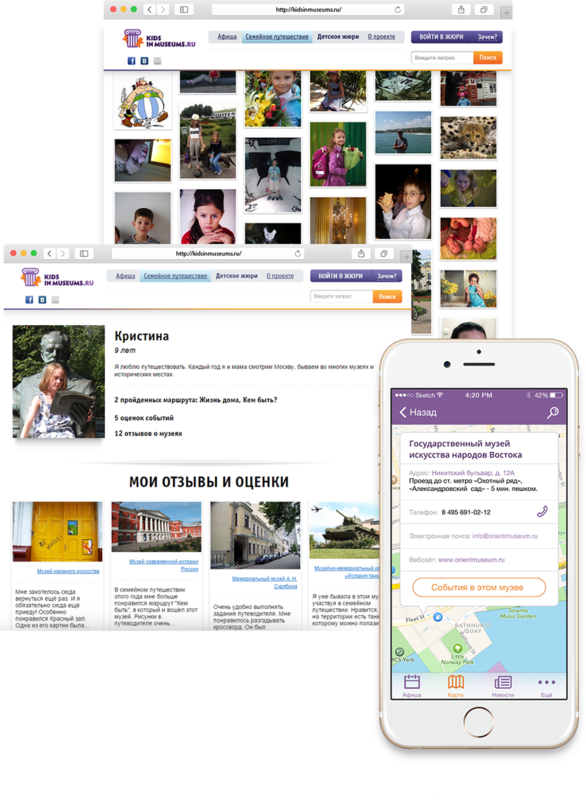 As we witnessed the growing popularity of the site, we also created a mobile application which allows one to learn about all museum events in a faster and more convenient way.